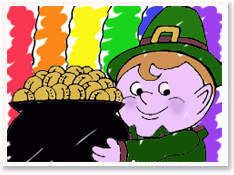 St. Patrick's Day, also known as St. Paddy's Day is a holiday to celebrate the Irish Saint, Patrick. It originated as a religious holiday but is mostly celebrated today for it's secular meaning with many more added traditions (color green, leprechauns, etc.). Here are some fun facts about the holiday for your family to enjoy. Many cities have a St. Patrick’s Day parade. Dublin, the capital of Ireland, has a huge St. Patrick’s Day festival from March 15-19, that features a parade, family carnivals, treasure hunt, dance, theatre and more. In North American, parades are often held on the Sunday before March 17. Some paint the yellow street lines green for the day! In Chicago, the Chicago River is dyed green with a special dye that only lasts a few hours. There has been a St. Patrick’s Day parade in Boston, Massachusetts since 1737. Montreal is home to Canada’s longest running St. Patrick’s Day parade, which began in 1824. Thanks Julie, my kids were asking all morning why we celebrate St. Patrick's Day and I kept telling them I'd have to check RedRoko and let them know. Julie--I liked this post as well because I wanted to know the history of St. Patrick's Day. Great job!